As the Olympics have got well underway in my home country this month, I thought I would hold my own competition; but this isn’t one of sporting prowess, this is a competition to see who the best endometriosis researching country in the world is. Every time I look through the research on endometriosis I notice there is a lot of it coming from all sorts of different places. I report here about individual stories of interest but wouldn’t it be good to see all the research in a wider context, and who is the best at it? Endometriosis is a global problem, it impacts negatively upon all the countries of the world both in terms of monetary value and in the surfeit of suffering the condition lays on all those affected. To that end then, it would be interesting to see which countries are at the forefront of tackling the problem of endometriosis, and which countries are falling behind. So over the last month I’ve been doing some research of my own to try and answer questions about the global scale of endometriosis research. As you can see it’s looking pretty good; the amount of research published on endometriosis has increased quite rapidly. 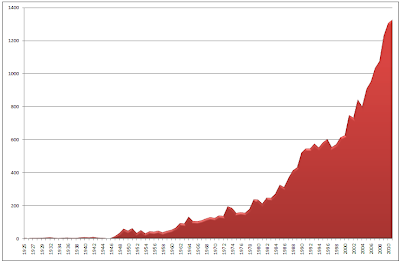 In fact the research output over the last 11 years is double that of the preceding 60 years! I suppose the next question to ask would be - where is all this research coming from? The map below shows which countries have produced the most research in endo over the years; the darker the country’s colour, the more research it has produced. Some surprises here. For example, did you know that Iran has published more research on endometriosis than Ireland? Or that Kenya has produced more endo research than Russia, despite the fact Russia is 30 times larger than Kenya. Unsurprisingly we can see that the vast majority of endometriosis research comes from North America, Western Europe and Japan. These countries (and continents) have always been the big hitters in the field of endo research, especially the United States, who lead the pack by quite some way. That’s an understatement really; according to the Scopus citation database the United Kingdom is the second most prolific endo research producing country in the world, with 1,659 articles published, which is pretty respectable. The UK however, looks like a dinghy compared the vast aircraft carrier of the United States contribution of 5,541 articles. 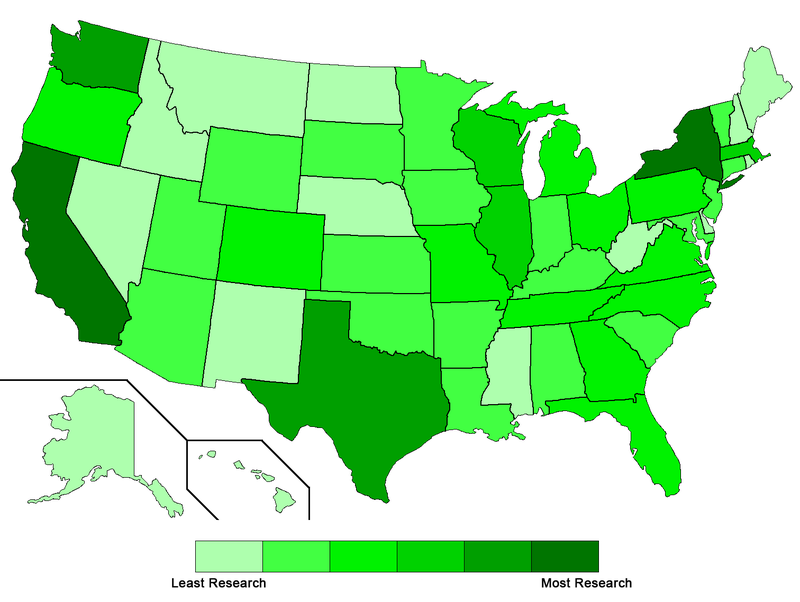 With that in mind I thought it would be interesting to focus on the US and see which states are producing the most endo research. So I put together a map similar to the one above but just for the US. So it looks like New York, California and Texas are leading the pack with a pretty poor show from Idaho, Montana and Nevada. Of course, what I’ve been showing thus far is all the research conducted to date, but how has the output of the world’s endometriosis research changed over time? To answer that the next few pictures show maps of the Top 10 endometriosis research producing countries, namely: United States, United Kingdom, Japan, Italy, Germany, France, Belgium, Spain, Canada and Australia, but I’ve also included four of the ‘up and coming’ countries of endo research, namely: China, Brazil, India and Turkey. Each country is represented by its flag, and the size of the flag represents the proportion of its research output compared to the other countries. Let’s start with the groovy era of the 1960’s. It’s plain to see where most of the endo research came from during these turbulent times. That said, between all the countries we are looking at, only 48 research articles were published on endometriosis during this entire decade. Let’s disco dance into the 1970’s and see how this changes. 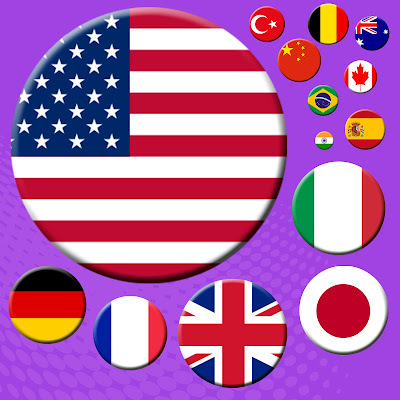 Well the US still retains its dominance, but an important point is that out of the 14 countries we’re looking at, only 6 were doing any endo research in the 1960’s. By the end of the 1970’s, 13 out of our 14 countries were now doing some endo research. Also the amount of endo research published has increased by nearly 1500%, which is the highest increase in endo research in the entire history of the world! Let’s see how the mullet clad scientists of the 1980’s faired. Whilst the fashion wasn’t much better in the 90’s, the global scale of endometriosis research was changing for the better. 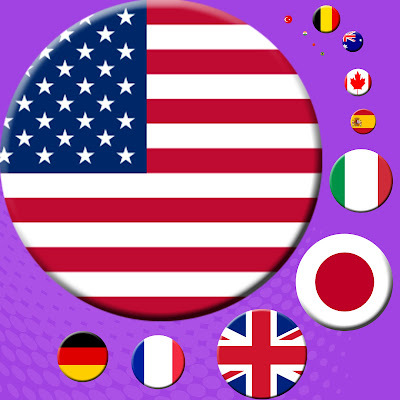 Japan and the UK grew in their output, as did Spain and Italy. France and Germany, whilst still generating a respectable amount of research, actually shrank a tiny amount. Belgium, despite being only a little country, showed it could hold its own against bigger countries like Canada and Australia. Also we see the sudden emergence of Turkey, a country that only produced two articles during between 1960 and 1989 suddenly, during the 90’s produces forty articles in one decade. Moving on to more recent times now, and the period between 2000 and 2011. 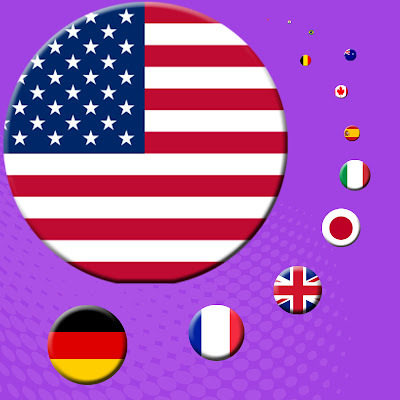 Well there’s a change; every country grows apart from the US (don’t worry American readers, it only shrinks relative to the other countries, the US still produces well over half the total endo research). The UK and Italy overtakes Japan; Belgium, Australia and Canada also make some decent growth. But by far the biggest surprise is China, Brazil, India and Turkey who explode onto the research scene, no doubt due to the economic surge in these countries. These four countries put together only produced less than 3% of the total endo research in the 1980’s, but produced 13% of the total output during the last 11 years. 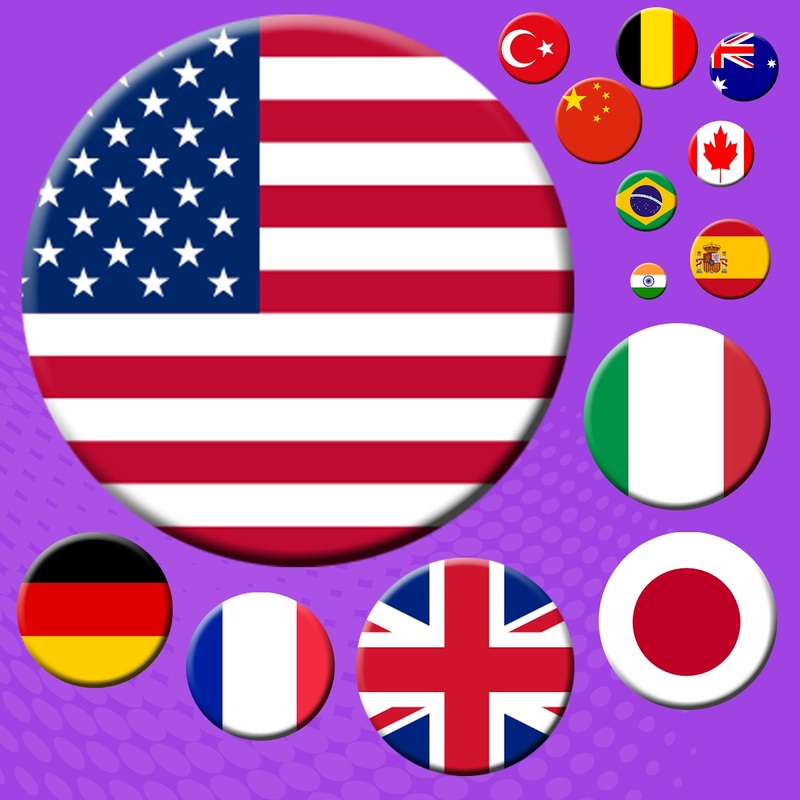 China in particular has, in the 2011-2012 period, overtaken most European countries except for The UK and Italy. Brazil and Turkey are both in hot pursuit. 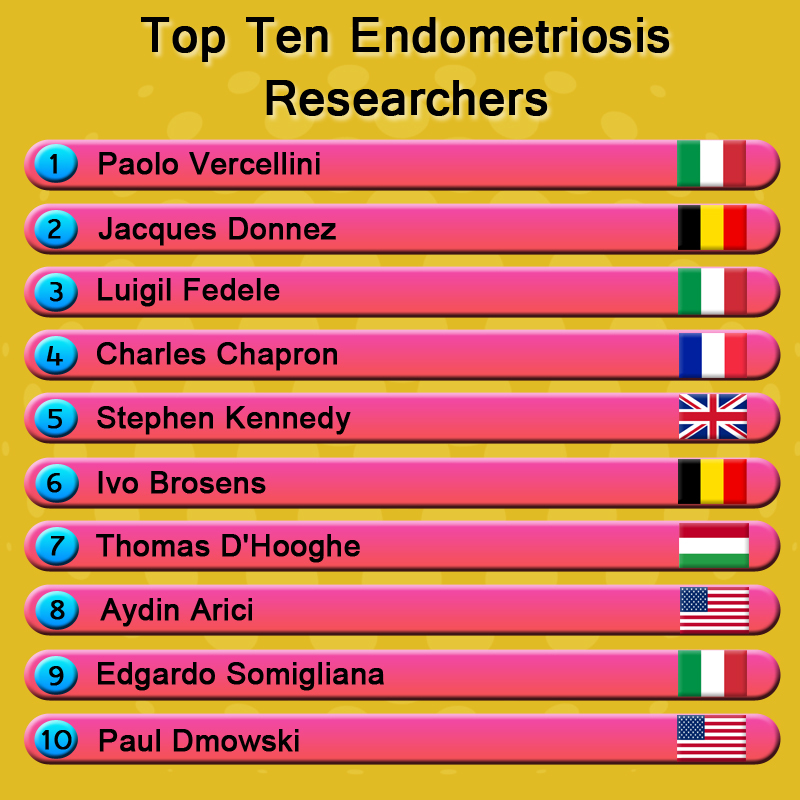 If the current trends continue, in the next ten to twenty years, these up and comers will be the dominant forces in the field of endometriosis research; but can anyone challenge the top spot of the mighty US? That remains to be seen. So far we’ve looked at certain countries and their research output, but what about the centres of endometriosis research within these countries, who can boast begin the best? 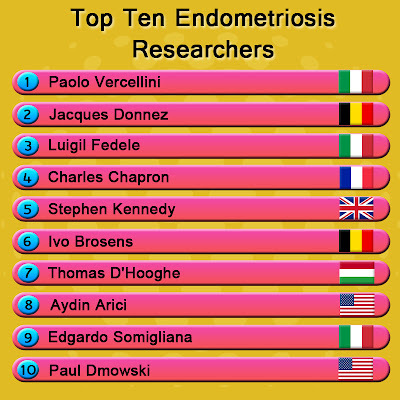 Below is a leader board of the top ten endometriosis research producing institutions and their associated countries. 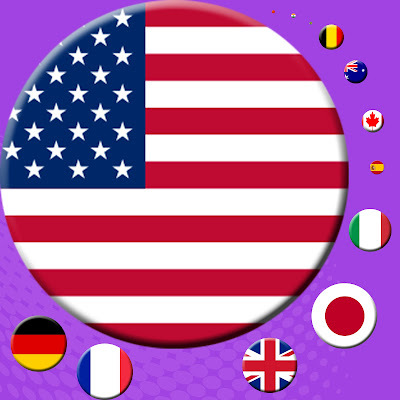 No surprise the see the US well represented here again. It’s also a rather excellent achievement for the University of Sao Paulo, ranking 5th in the world is no mean feat, especially as they have only relatively recently started putting serious effort into endo research. But the gold medal goes to the University of Milan, felicitazioni! to you my friends. To finish though, I think we need to acknowledge the individuals who contribute most to taking the monster of endometriosis by the horns and trying to beat it into submission. Below is a list of the Individuals who have contributed most to the field of endometriosis research by way of peer reviewed publications. The world owes a great debt of gratitude to these people who work so tirelessly to better understand endometriosis and, if one day, I could make it onto that list, I would go to my grave a happy man. Of course it doesn’t end here, there are many, many people out there deserving of our praise; from doctors to awareness raisers, advocates, scientists and women who refuse to be defeated by endometriosis. There are too many of you to name, but you know who you are and you are all an inspiration. If our collective was a living being and each of us represented a different part of that being, the excellent doctors who understand a woman’s struggle would be the healing hands; the researchers and scientists would be the enquiring mind, always thinking ahead; and the women who suffer this disease? You who face it every day, yet in facing it do not allow it to overcome you? You would be the heart and soul, you are the driving force without which the world’s interest in endometriosis would wane and grind to a halt. When the cure for endometriosis arrives, it will be because of someone like you. All information on published works were retrieved from the Scopus database, where the title/abstract/keyword contains the word ‘endometriosis’ published up to the end of 2011 unless otherwise stated. Additionally, countries that no longer exist (such as the Soviet Union or Czechoslovakia) were not included in the search. Only articles using the Greek/Latin term endometriosis were included in the search, therefore some articles which use language specific variations of endometriosis would have been omitted. 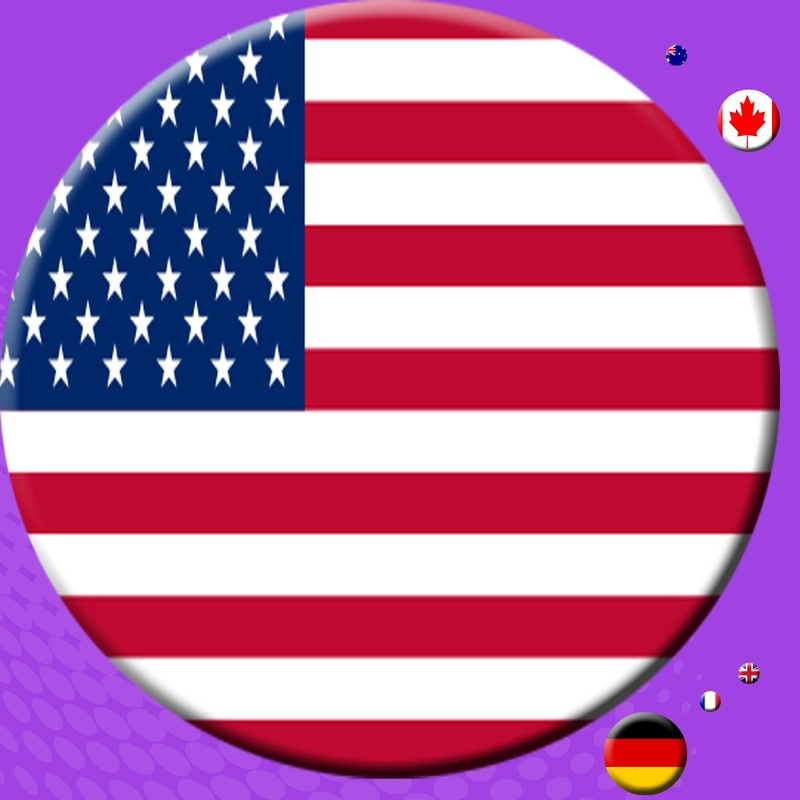 For the US map, a search was conducted for articles where the state affiliated with the article was given; therefore some publications will have been missed. For the top ten lists only articles which contained the word ‘endometriosis’ in the title were considered. For the institutional and individual lists, research output was quantified by total number of publications over all years. This is a great post and some very interesting information to know where to share what we learn! I have written a blog and have discovered many things about Endometriosis. I have had the condition since I was 19 and through my own research discovered heaps about it! I share it all on my blog: www.cureendometriosis.com. My mission is to cure myself of Endometriosis and then share that knowledge with the world! Thank you for sharing and I hope I become a pioneer to help women around the world! I was surprised to know about Brazil, because in the south, where I live, it's so difficult to find specialists and most people haven't even heard of endo! Great post! Thanks!